The mid-elevation forests of the northern Rockies are relatively moist, receiving at least 20 inches of mean annual precipitation. The wetter conditions allow drought-tolerant tree species such as ponderosa pine, Douglas-fir, western larch, western white pine, and lodgepole pine to grow alongside less drought-tolerant species like grand fir, western redcedar, western hemlock, Englemann spruce, and subalpine fir. These species co-occur in various combinations between 3000-7000 feet throughout western Montana and northern Idaho. These assemblages are generally referred to as "mixed conifer" forests. Douglas-fir is common throughout the entire spectrum of these forests but is most abundant on sites receiving 20 to 25 inches of rain per year - the driest of the moist montane forests. Some of these relatively warm, dry stands may also support ponderosa pine and appear similar to low-elevation, dry forests. Grand fir is also common at low to middle elevations, but typically predominates on sites receiving >25 inches of precipitation per year (Arno 1980, Peet 1988). On even wetter (greater than 32 inches of annual rainfall) yet still relatively warm sites, luxuriant forests of western redcedar and western hemlock can be found. These highly productive forests, which can contain representatives of all other eight tree species listed above, tend to occur at moderately low elevations (below 5,000 feet) within the balmy, maritime-influenced climatic zone of the northern Rocky Mountains (Arno 1979, Cooper et al. 1991). This zone generally extends from northern Idaho eastward in Montana to Glacier National Park and to the Swan, Clearwater, lower Blackfoot, and Bitterroot river valleys (Arno 1979). 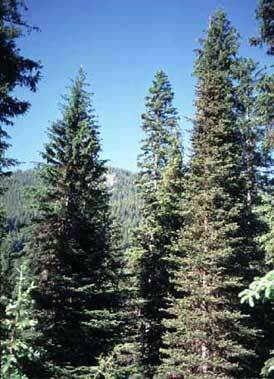 On cooler sites, mixtures of western larch, lodgepole pine, subalpine fir, and Englemann spruce are common. The often-luxuriant understories of moist montane forests tend to consist of diverse mixtures of shrubs and moist-site forbs. Common woody species include ninebark, common snowberry, white spirea, oceanspray, blue huckleberry, dwarf huckleberry, grouse whortleberry, bearberry, twinflower, Sitka alder, red-osier dogwood, Utah honeysuckle, menziesia, thimbleberry, common juniper, bunchberry, bristly black currant, russet buffaloberry, Saskatoon serviceberry, and devil's club. Forbs include starry Solomon's seal, rough-coated fairybells, western meadow-rue, broadleaf arnica, heartleaf arnica, mountain arnica, red baneberry, queencup beadlily, sweetscented bedstraw, Richardson's geranium, arrowleaf groundsel, wild ginger, twistedstalk, darkwoods violet, wild sarsaparilla, and western rattlesnake plantain. Other understory associates include bluejoint reedgrass, pinegrass, Columbia brome, field horsetail, oak fern, lady fern, common beargrass, and elk sedge. 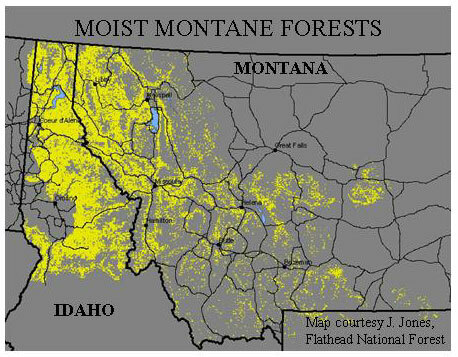 Moist montane forests, shown in yellow in the map to the left, make up 52% of the forested area in our target area. A nice collection of photos of western Montana and northern Idaho forests is housed within R. E. Rosiere's Range Types of North America website under the Northern Rocky Mountain Forest section. Moist montane forest is represented in photos 1, 2, 3, 8, 9, 10, 11, 12, 13, 14, 15, 17, 18, 19, 20, 21, 22, 23, 24, 25, 26, 27, 28, 29, 30, 31, 32, 33, 34, 35, 36, 37, 38, 39, 40, 41, 42, 43, 44, 45, 46, 47, 48, 49, 50, 51, 52, 103, 123, 125, 126, 127, 128, 129, 130, 131, and 132. Moist, montane forests dominated by Douglas-fir can be found west of Missoula in west-central Montana. Spruce dominated forests can be found on benches and gentle north slopes in northwestern Montana. It is quite common in the Flathead Valley and is occasionally found to the west in the Kootenai National Forest. 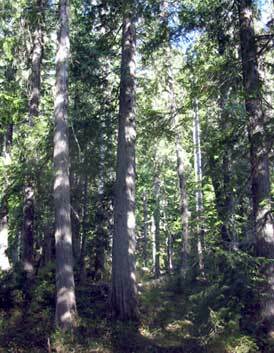 In Montana, the cedar-hemlock forest type is most common along moist canyon bottom sites or seepages. 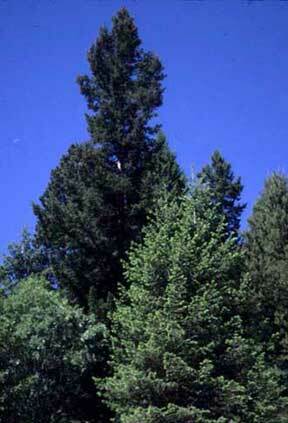 Western hemlock and western red cedar are widespread in parts of northern Idaho.